The Lutron Skylark Dimmer is a beautiful addition to any room in your home. The Skylark Dimmer is the original designer style slide dimmer from Lutron. Features include an easy to use slide control, adjusts the light to suit any activity. Slide up to brighten, down to dim. This Skylark is for use in a 600 watt, single pole application where the light is controlled from one switch. Replaces any decorator style switch and works with existing multi-gang decorator wall plates. Coordinating Claro wall plates and accessories sold separately. The Ariadni C.L dimmer works with dimmable LED and CFL screw-in bulbs up to 250 Watts and is also compatible with up to 600 Watts of standard incandescent and halogen bulbs, allowing you to control all 4 bulb types on the same circuit. It is designed to control a broad range of dimmable LED and CFL bulbs from a variety of brands including Philips, Cree, GE, Eco Smart and Lighting Science. The Ariadni/Toggler C.L matches your existing toggle switches. It features a slider to adjust your light to any activity and the toggle switch turns your lights off or on---returning the lights to your favorite level. Please see Lutron's Compatible Bulb List to view the current listing of compatible bulbs that work with this dimmer. Coordinating Fassada wall plate sold separately. Claro wallplates are a simple and elegant solution designed to match your existing decorator opening dimmers, switches and accessories. They feature a clean appearance with no visible screws and mount flush to the wall. Claro wallplates are oversized to hide gaps around wallboxes and attach securely and snugly in place regardless of the wall condition. Claro wallplates are easy to install. Simply separate the front and back plates, attach the back plate to the wall with the screws provided and snap on the front plate for a clean and sophisticated look in just minutes. The Diva 250 Watt C.L works with dimmable LED and CFL screw-in bulbs up to 250 Watts and is also compatible with up to 600 Watts of standard incandescent and halogen bulbs, allowing you to control all 4 bulb types on the same circuit. It is designed to control a broad range of dimmable LED and CFL bulbs from a variety of brands including Philips, Cree, GE, Eco Smart and Lighting Science. 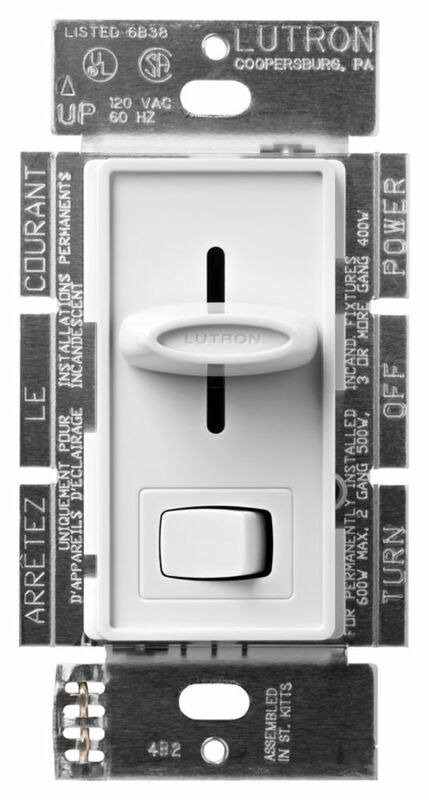 With the same features as Lurton's Diva Dimmer, the large paddle switch turns the light on/off and returns to your favourite setting. The discreet slider adjusts the light level to suit any activity. Please see Lutron's Compatible Bulb List to view the current listing of compatible bulbs that work with this dimmer. Coordinating Claro wall plate sold separately. Save energy and extend bulb life with the Glyder dimmer from Lutron. Simply move the slider up to turn lights on or to increase light level. Move the slider down to decrease light level and turn the lights off. Easy to install and operate. Fits traditional style wall plate openings and includes both a white and ivory knob. Skylark 600-Watt Single Pole Dimmer - White The Lutron Skylark Dimmer is a beautiful addition to any room in your home. The Skylark Dimmer is the original designer style slide dimmer from Lutron. Features include an easy to use slide control, adjusts the light to suit any activity. Slide up to brighten, down to dim. This Skylark is for use in a 600 watt, single pole application where the light is controlled from one switch. Replaces any decorator style switch and works with existing multi-gang decorator wall plates. Coordinating Claro wall plates and accessories sold separately.